Stir-fried meals are a quick and healthy way to eat, choosing vegetables and meats, quick fried to reduce loss of nutritional value due to prolonged cooking times. Use good grade non-smoking oils like canola or peanut oil. Add cold oil to a hot wok or frying pan. Add foods in the order of cooking time, from most to least. Harder vegetables like broccoli or celery are added first. Soft foods like mushrooms are added near the end. Not only are stir-fry meals a good source of vitamins, minerals and necessary amino acids, they are quick and easy to prepare. Experiment with various combinations using favorite vegetables, fruits, meats and nuts. Serve stir-fried mixtures over brown rice, a healthier choice high in potassium, omega 6 fatty acids and fiber. Lean cuts of chicken work superbly for a stir-fry. Choose skinless breasts and cube for the wok. Use very hot oil and cook the meat quickly. Set it aside to drain in a sieve or on toweling. The cooked meat can be added after the vegetables are finished. This reduces the chance the meat will dry out with extended cooking time. Cut chicken in thin slices. Marinating adds flavor to chicken and pork. Use soy sauce, fruit juices, red wine, lemon or lime juice. Lean pork is flavorful and combines well with a wide variety of vegetables, especially the fall types such as squash and eggplant, pumpkin and turnip. Add apple for a seasonal flavor. Lean fish adds not only flavor, but also vitamin A, choline and protein. When using fish for stir-fry meals choose halibut, salmon or tuna. The flesh is sturdy, with a delicate taste that works well with flavorful stir-fried vegetables. Be sure to remove all bones and cut into chunks Try to cut against the grain to avoid flaking once it's cooked. Add the fish chunks into the stir-fried vegetables when they are nearly done. Avoid stirring too much, making sure to gently turn the fish to cook thoroughly. Fish adds not only amazing taste and texture, but is high in omega 3s, protein, vitamin A and folate. Fish is a wise and healthy choice for healthier stir-fry meals. 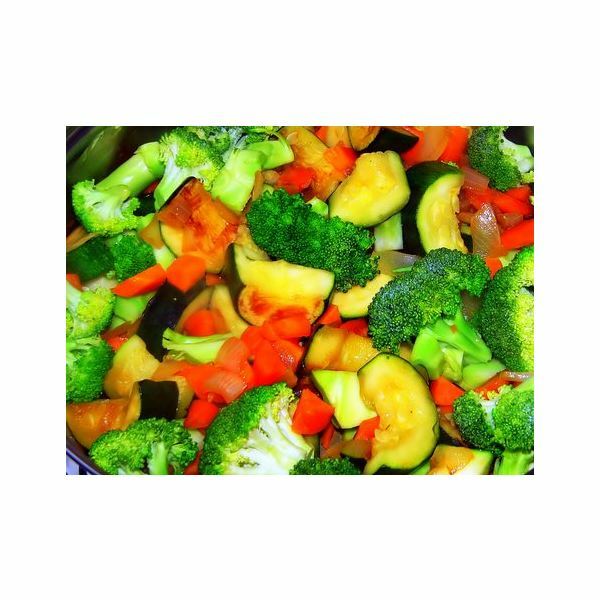 Use a wide variety of vegetables for your stir-fry meals to avoid boredom. Group vegetables according to cooking time to make the process easier. Line them up in the order they'll be added, from firmest to softest type. Avoid using vegetables that produce gas that can cause bloating and discomfort. Experiment with various combinations to see which works best for you and your family. To reduce sodium, use low-sodium soy sauce. Even the low-sodium varieties contain up to 25 percent of the recommended daily allowance with over 600mg of sodium per tablespoon. Reduce how much sauce you use and experiment with mixtures to further reduce salt. Use pear or apple juice for a light flavor with summer vegetables and prune juice for a darker full-bodied flavoring. A touch of honey or sesame oil added to the hot vegetables at the end adds a sweet or nutty flavor enriching the various stir-fry taste combinations. Fruits can be added to stir-fries at the end of cooking time. You want the fruits to remain juicy and cool. Grapes, lychee nuts, small pieces of orange or lime and grated pear add simple but delicious flavors to the vegetables and lean meats. Fruits contain vitamin C and D, amino acids, minerals and beneficial fiber. Marinate lean chicken or pork in fruit juice. Not only does the juice add flavor, it helps to tenderize the meat, making it a more digestible fiber. Various types of nuts add flavor and texture to stir-fry meals. Cashew, a favorite in oriental recipes, add magnesium and are high in antioxidants. Peanuts contain high quantities of potassium, choline and omega 6 fatty acids. Be sure to get unsalted nuts to avoid adding high levels of sodium to healthy stir fry meals. Stir-fries provide variety and taste. With so many combinations to choose from, any stir-fry can be a delicious and nutritious addition to meals as a side dish or main course. What Are Some Healthy Graduation Party Food Ideas?